JDR Karting is approximately 300m long with an average lap time of 24 seconds featuring three very exciting High-Speed Banking corners. Its unique tarmac surface provides an ultra-smooth ride for the drivers and lends itself to some very challenging racing. There is excellent viewing provided by two purpose built multi-level viewing platforms, which contain a series of vending machines providing sweets, crisps, confectionery, hot & cold drinks and also games machines to keep all ages entertained. There is computerised lap timing that allows drivers to view their lap times, overall positions and when they are racing next and the track complies with all NKA requirements. From the M5 junction 11 follow signs for Gloucester Historic Docks. Go past the docks and we are on the main road just past Burger King. Take the next turn right into Madleaze Industrial Estate and follow signs for JDR Karting car park. 12-minute arrive-and-drive session. The battery-powered cadet karts are ideal for 6 - 11 yr olds and feature adjustable speed limits that can be set according to the ability of the drivers. 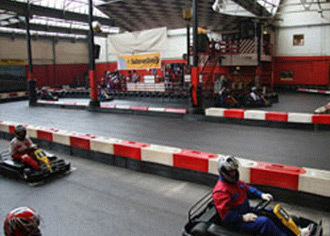 One hour's exclusive use of the circuit for up to 12 cadets (aged 6 - 11 years) driving battery-powered go-Karts. The Racing Rascals electric karts are ideal for young children from 4yrs-7yrs of age. 20-minute arrive and drive session. The battery-powered cadet karts are ideal for 6 - 11 yr olds and feature adjustable speed limits that can be set according to the ability of the drivers. A 90-minute team endurance event. Twenty minutes Qualifying to determine your grid position then a non-stop relay event for teams of 2 to 4 drivers sharing a kart.